Ba Ria-Vung Tau (VNA) – The southern province of Ba Ria-Vung Tau has licensed nearly 569 million USD registered for 11 new projects and 12 existing projects of both domestic and foreign investors since the beginning of 2019. This sum of capital is equivalent to 47.4 percent of the province’s target for the entire year– 1.2 billion USD, according to the local industrial zone authority. In the same period, 189 million USD was disbursed for projects at local industrial parks in the first quarter, surging by 210 percent year on year. 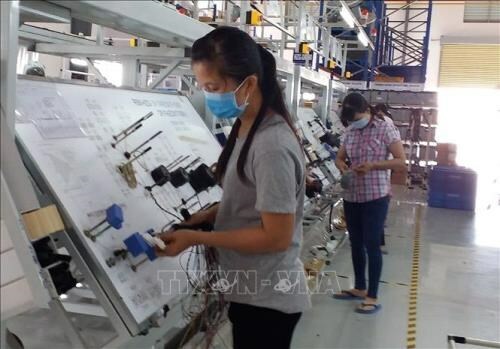 Head of the authority Nguyen Anh Triet highlighted the positive flow of investment into local industrial parks, noting that most of the zones have completed their infrastructure, which will offer more choices for investors to locate their projects. Industrial parks in Ba Ria-Vung Tau are currently home to 385 valid projects with total registered capital of more than 19 billion USD. They include 188 projects of domestic investors with combined capital of nearly 97 trillion VND and 1.5 billion USD, and 197 foreign invested ones worth almost 11.5 billion USD. In the three months, businesses at these zones also posted strong growth. Their industrial production value reached 78.1 trillion VND, while their revenue was estimated at 3.16 billion USD, up 31 percent and 26 percent from a year earlier, respectively. Enterprises in the province earned 791 million USD in exports and imported over 1.5 billion USD worth of goods during the period, respectively rising by 41 percent and 76 percent year on year.